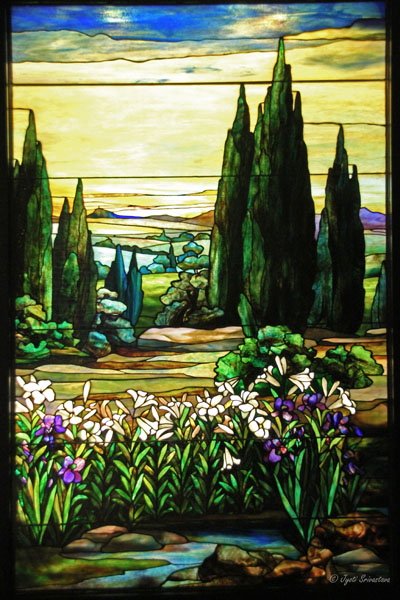 One could spend many months delving into the topic of stained glass and how Louis C. Tiffany advanced the contemporary art of glassmaking, but the goal of this post is a brief overview. 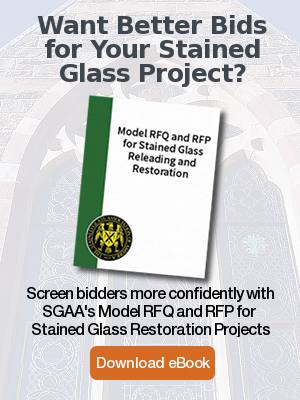 It will support the case for only using a studio with artisans and craftsmen who possess the experience and knowhow required to restore Tiffany stained glass and a complete facility within which to safely remake the lead came and restore the glass. To do otherwise is to risk reducing or destroying the value of an unparalleled treasure, a Tiffany stained glass window. Tiffany stained glass windows are priceless because they are irreplaceable. Rohlf’s Stained & Leaded Glass Studio has a long tradition of restoring Tiffany glass in religious and landmark buildings. In two previous blog posts, we describe the work Rohlf’s has done to restore the enormous, 800-pound Celtic cross, a Tiffany masterpiece, at St. Hubert’s Chapel in New Jersey. Rohlf’s also restored the renowned Tiffany clock atop Grand Central Station, a process that involved dismantling the 13 foot wide clock piece by piece and numeral by numeral and cleaning and replicating areas of heavy damage. How did Tiffany bring innovation to contemporary stained glass windows? Louis Tiffany started his professional life as an interior designer. In 1865, he traveled to Europe to take in the culture and offerings of the many art museums there. He was especially drawn to the collections of the Victoria and Albert Museum in London, where the number and variety of pieces of Roman and Syrian glass made a strong impression. A few years after returning the the United States, in 1878, he opened his own studio and glass foundry because he was unable to locate glass possessing the precise look he sought to create. In this way, he could make glass to his liking. Prior to Tiffany, stained glass production had not changed much since medieval times, when flat panes of glass were painted, using brush. Tiffany experimented to produce a whole range of new colors and textures which revolutionized the production of glass. And while he made many objects ranging from mosaics, vases, and enamels to jewelry, he is most famous for his stained glass. A picture is worth a thousand words, so let’s use the picture below to illustrate the new methods of glassmaking and especially the complexity Tiffany brought to his work. Iridescent glass, which even in a flat picture, stands out on a page in the form of pearl-like beads. Louis Tiffany also experimented with plating. 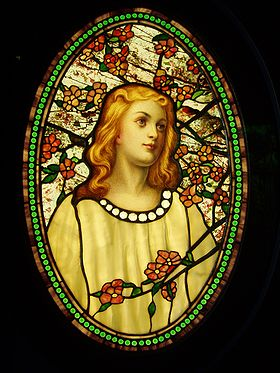 In earlier generations, stained glass was two-dimensional, but Tiffany made three-dimensional glass by using different layers of glass of different colors and density, in reverse order. As Hans Rohlf explains, Tiffany might have employed four layers of glass on a garment surrounded by two layers of glass in the background. Or, he may have used plating techniques to create a depth of field in a landscape view, where the viewer’s gaze is taken to a far-off pond. As in Landscape with Yellow Sky, by Agnes F. Northrup / Tiffany Studio. He also made significant advances in the techniques of leading and copper foil. Before, the lead pieces (called caming) that held the glass together were not part of the design. Typically, they were of uniform thickness and might have been placed arbitrarily into the design. In contrast, Tiffany integrated the cames and copper foil into the design which created the different widths. He also used came and foil that permitted multiple levels of the lead to be stacked on top of each other, and then soldered and floated the cames and foil together. Another important consideration: The plan for restoration must take into account the worth of the windows. The value of the goods being transported should never exceed what they are insured for, and similarly, a restoration firm must have sufficient type and limits of insurance to cover the goods being repaired at their facilities. Rohlf’s carries Bailee’s Customers Insurance. Thus a Tiffany project will often start off with a professional appraisal by Rohlf’s, so a restoration plan is made that is both doable and in terms of keeping within our large insurance cap of $2.25 million (greater amounts of coverage can be obtained if needed). If you would like to know more about our capabilities, or receive a custom appraisal, please contact us. 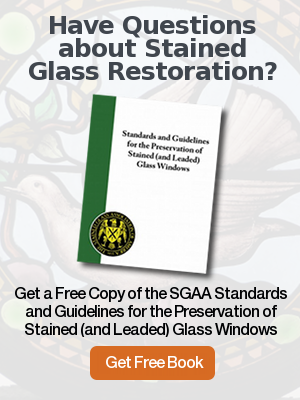 ← Highest Level of Craftsmanship Ensures Impeccable Restoration of Stained Glass Window by John Bolton.